For schools wishing to reinforce and build on lessons learned during their participation in our first year supply drive, an optional second year program is available. As with the first year program, a fall presentation is given at each school. Not only are the successes of the prior year’s supply drive highlighted, students also experience a more detailed examination of the struggles Ugandan students experience as a regular part of their everyday lives. 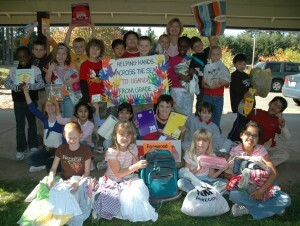 After the presentation, students are again invited to participate in a supply drive for their Ugandan counterparts. In addition to the supply drive, a funding component is added; providing U.S. schools the option to address specific needs in Ugandan schools as a community. Through our second year program, U.S. schools have helped fund capacity building projects (classrooms & dormitories), enrichment programs (libraries & school equipment), health initiatives (bath houses & water projects), scholarships and more. Each school’s implementation of the funding component is unique to their own community, but all share one thing in common – their own communities benefitted as much if not more than their Ugandan partners. Our second year program encourages students to work together both individually and as a community. Students not only gain an appreciation of what they can accomplish as individuals, but also what can be achieved in cooperation with others.